best hotel view in the area!" We will re-open on April 26, 2019. Reservation: Online reservation will be open on January 9, 2019 by Desktop only. Third-party reservation will be open at the end of February. A side note regarding third-party reservations; they typically are on average 12% higher due to fees associated with them. Phone-Reservation are open Monday - Thursday from 10:00 a.m. to 2:00 p.m. On April 26, 2019 our phone lines will be open 24 hours a day. 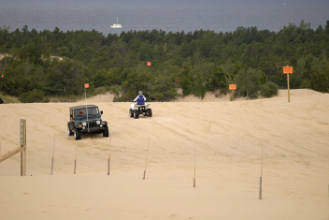 If you are going to visit Silver Lake Sand Dunes OVR area, don't forget to check out its website to be up-to-date on what is needed before you go out on the dunes. Enjoy a resort with breathtaking views as it is located on Silver Lake and overlooks the remarkable sand dunes. Between Silver Lake and Lake Michigan some 2,000 acres of open moving sand dunes create a panorama that is both amazing and inviting. Experience the dunes in a Dune Buggy, hike over the open sand, bring or rent an off-road vehicle to test your skills, or enjoy a delightful and informative Jeep tour of this spectacular area. You are guaranteed to find what you and your family are looking for as you explore the Silver Lake Sand Dunes/Hart area. Unwind in one of our relaxing in-room spas or take a dip in our 62 foot long indoor swimming pool. A day of sunbathing is simple and convenient as Dunes Waterfront Resort offers a private beach and sundeck. 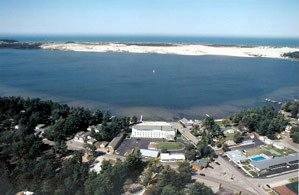 You may also want to bring or rent a boat to explore Silver Lake and the majestic sand dunes. Make your final destination our private dock. The entire top floor of the resort is dedicated to family friendly amenities including the indoor pool, hot tub, and game room. If romance is your desire, evening time brings a lovely sunset across Silver Lake which can be coupled with a nighttime walk along the Lake Michigan beach. As you return to your guest room after a splendid day in this serene area, you can rest easy knowing our facility is smoke free. Because we are concerned about the safety of our guests, fireworks are not permitted on hotel property. Looking for a rewarding and fun activity? Within walking distance of the resort you can drive a Go Kart, play a round of miniature golf, shop for a one of a kind memento, or even pick up your favorite ice cream treat. Another diversion located steps from the resort is Silver Lake, a fishing hole that provides an abundance of Walleye, Largemouth & Smallmouth Bass, Northern Pike, Bluegill, and Black Crappie. If history and natural beauty are what you crave, a short scenic drive to Little Sable Point Lighthouse might be exactly what you need. Whatever your pleasure, let Dunes Waterfront Resort help you and your family start creating memories that will last a lifetime! Copyright©2019 Dunes Waterfront Resort - Produced by Gaslight Media, All Rights Reserved.